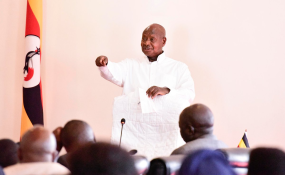 Uganda's President Yoweri Museveni has blamed civil society organizations, foreign interference, and the media for the recent political protests. Analysts say that his words signify a closing up of civic spaces. "The state of Uganda will not allow anybody to burn Kampala as they hoped for," President Museveni said in a speech on Sunday, September 9. "The NGOs give money to some of our youths to burn tires on the roads, throw stones, commit arson, to rig elections, beat women. Sometimes our youth go into these criminal projects because they want money, they don't enjoy doing it," the president alleged. The four-hour-long televised speech came after protests had rocked the Ugandan capital as well as the northern town of Arua. They broke out after the government arrested the opposition lawmaker, Robert Kyagulanyi, who is better known under his artist name Bobi Wine. He was arrested as one of the 33 suspects accused of committing treason and allegedly having thrown stones at President Museveni's car. Kyagulanyi, who was released on bail and has now left the country, claims he was tortured in detention. The arrest of the popular musician and government critic sparked an uproar not only in Uganda but also abroad, where human rights supporters and Ugandans in the diaspora called for his release. A few days before the speech, the government announced that it was probing non-governmental organizations it believed were sponsoring the protests. Richard Sewakiryanga, Executive Director of the Uganda National NGO Forum said the president's remarks are concerning. "I think that that accusation in itself is an empty one and it could be one that is propagated by those that would like to sow seeds of discontent between civil society organizations of this country and the president of this country," he told DW. "The work that we do which is to defend rights, to promote better service delivery, to promote better governance of this country, I think it is legitimate work," he said, in defense of the NGOs. Civic rights or foreign interference? President Museveni's accusations were however not only aimed local NGOs. He alleged that the organizations were being funded from abroad and were promoting foreign interests. Peter Magelah, a lawyer and social scientist with the local human rights organization Chapter Four Uganda believes that a more plausible explanation for the Museveni's accusations is the outspokenness of the civil society organizations (CSOs). "A lot of violations that have taken place in Uganda, it's the CSOs that have pushed for accountability. That puts them in direct conflict with the government," he told DW. NGO or CSO offices have in recent years been raided, by what they believe to be police and security forces. Laptops and hard-drives are then confiscated, but no legal action has resulted from the seizing of the NGO data, explained Magelah. "Actually there haven't been any charges from any NGO for any kind of crime. You have some investigations - so I think they are just part of the intimidation," Magelah said. The clampdown on NGOs has been building up, Magelah said. In 2015, he remembers, the government put more strict NGO laws in place after accusing NGOs or disrupting discussions around oil and gas deals. The laws resulted in more paperwork from the NGOs - more memorandums of understanding with the local authorities had to be signed and the NGOs had to submit their budgets for approval. "Basically the NGOs are micro-managed by the government," Magelah explained. These latest accusations, Magelah believes, might lead to further regulation of the sector. The local and foreign media, Uganda's president alleged, were also responsible for fueling protests. "You only report the negative, you don't report the positive. This country does not belong to you, it belongs to us," he argued. "Organizationally and technically we are going to deploy means to handle this sabotage," he warned, saying that the media had spun the story around Bobi Wine's arrest into an outright campaign. Robert Sempala of the Human Rights Network for Journalists fought off the accusations. "We believe that there is sheer lack of appreciation for the role and importance the media plays in a society because it is also wrong to make a blanket statement against the media," Sempala said. He, however, also emphasized the responsibility of the media to portray both sides of the political divide. "We also see the president trying to arm-twist the media to only give audience to government and not voices of dissent," he said. It is not the first time the media is facing Museveni's wrath. His government has banned and sometimes closed down radio and TV stations for hosting opposition figures. It is also mandatory to give government officials free airtime whenever they have a government program to promote. It is not clear what measures the government intends to take to manage the media. But certain media houses have according to sources been warned that they will lose their licenses unless they toe the government line and promote its policies.